I wanted to give you all a quick update on my cotton lint spinning. Eight 100 gram skeins are spun, with at least two purples to go. The differences in the oranges and greens are subtle, but this seemed to be the best photo to catch them. I also have several other colors, which used the printers' primaries including the pastels from my exhaust experiments. At the moment I'm mostly interested in a rainbow set of colors, though I don't have a specific project in mind for them. On another note, I learned how to do a sort of watermark with The GIMP. Now I need your opinions. Does it distract too much from the photo???????? Good heavens, you are a productive spinner! Those yarns look gorgeous, and IMHO the watermark is fine - very professional. Oh MY! 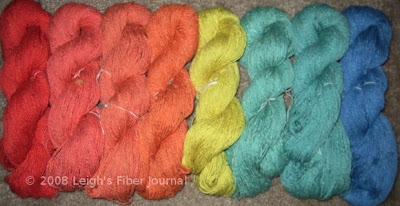 what wonderful skeins! And the watermark is fine. I've seen many people these days use them and after what happened to you, I think that it is a great idea. Awesome spinning and honestly didn't even notice the watermark until you brought it to my attention. All I can say is WOW! Your spinning is lovely just like your weaving. I also didn't notice the watermark until I read about it. your watermark is fine! it is subtle but also absolutely essential; your hard work deserves to be protected and celebrated because, clearly, i am not alone in finding your regular and comprehensive contributions to the cyber-fiber world profoundly inspiring! Your yarns are beautiful!!!! I can't wait to see what you make with them. Watermark is hardly noticeable. Good idea. I agree with Jeannie. But I would add that in this case of this photo I would splash that watermark right in the middle so no one could crop it out. It still would not be distracting but it could hot be used. Also, it looks like you have reduced the size of the image, which also makes it much less valuable as an image for stealing. Good job--both with the spinning and the watermarking! Wonderful skeins! Perhaps you'll be weaving a color gamp? The watermark looks fine. I was wondering earlier why you hadn't done that already. Ooooo wow! Here's a project of what to do with the rainbow - sell it on Etsy in your store (me wants to get me hands on that rainbow... been wanting to knit some linty goodness)! Those skeins are a definite Wow! If the watermark is to protect your property from theft, then I think it's a good thing. If not, it is a little distracting because it caught my eye immediately. You know, like the Sesame Street song, "One of the things is not like the other, one of the these things is not the same." The watermark works for me. Thanks very much for all the informative postings -- I really enjoyed the fading experiment, it was a great tip on how to test for that in my own dyeing! I used to watermark with a digital mark using photoshop and could run a tracer with that, but it was a subscription service. It was important when I was doing a lot of custom digital artwork. Now, I just run a search on the name of my photo and see where (if anywhere it pops up). My blog is proof of exisiting copyright because of the date of use, as well as my camera raw files that have the original date. A subtle watermark is helpful, and I think yours looks great. 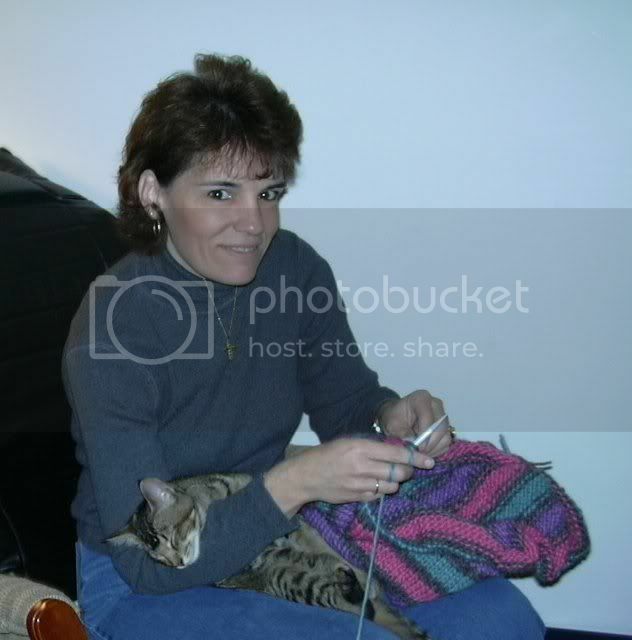 I love that yarn! And so much of it... Wow! I also think the watermark looks quite good. It adds a very professional touch to the photo. The yarn is beautiful. Each color is lovely by itself, and yet they all seem to go together quite well. I don't think the watermark is distracting at all. I've seen some folks who splash their watermark straight across the photo REALLY BIG, and those can be a problem. One can hardly see the picture. But yours is discrete and professional looking. Those yarns are absolutely beautiful. I don't like watermarks on photos. I sit here reading the watermark, not looking at the photo. Of course if it isn't splashed across the best bit of the image it doesn't protect you picture, as it is I could download and make use of half you photo without anyone knowing it had had a watermark. Or I could down load and use a band from the centre of the picture. In fact, as an expert Photoshop user I could easily remove the watermark altogether. If you do use one, you need it to be central or there's no point. But I really don't like it because I want to enjoy looking at the picture. Don't like to be so negative, but you asked and I'm probably too honest.. best way to protect pictures is keep them off the internet. As much as I appreciate all the feedback, I have to agree with Dorothy. I can't get over the watermark as a distraction. I absolutely don't want to splash it across the photo, and I agree that a subtle one along the edge can easily be cropped. If I had my own website I'd worry more about hotlinking. But I'm not paying for my bandwidth here so oh well. Phew, I had to check back because I was worried that I was a wet blanket. I know the intellectual property rights problems for you have been ugly, so am pleased to see that I wasn't the only one who saw the proprietary announcement at the bottom were eye catching. I don't know what the perfect solution is - I hope you find it. lookie, rainbows! I didn't even notice the watermark until you mentioned it. I did see the water mark first but do not find it distracting. The colors of your yarn and the yarn itself are still the main focus and beautiful to say the least! Oh I love color! I don't like flies or poop but to give up raising my sheep because of a small, some times not so small annoying part of farm life would be the death of me. No way! So blog on and keep the crape on the side and make compost. For those who find a problem with the watermark being eye catching: What is the problem with the watermark being eye catching? Does it in any way affect what you learn from the photo? And isn't the point to discourage anyone from using that photo for other purposes? My land that is beautiful. Such a great color gradient. As for the copyright, I didn't even notice it until you said something. Please, could you tell me how you managed the watermark? Sheepish Annie sent me over because I am new to The GIMP and my PSP image is so old that the current version of GIMP can't read it.